On Sunday… The fanatical Gaza Islamist group “Swords of Truth” threatened to “cut the throats from vein to vein” of female TV broadcasters if they don’t wear strict Islamic dress. But, this didn’t srop several brave female Gaza reporters from protesting against this Islamic threat on Sunday… and then again on Monday. 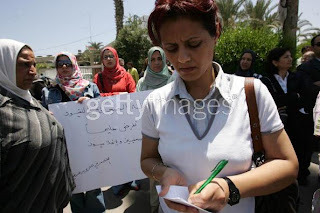 GAZA CITY, Gaza — Several dozen Palestinian television journalists protested Sunday in Gaza after a shadowy Islamist group threatened to decapitate female journalists who did not dress according to a strict Islamic dress code. The protestors assembled in front of the office of President Mahmoud Abbas to demand protection after the threat made by the Swords of Islamic Truth group. “We demand that the presidency take protection measures for the television employees, as we think that the threats are serious,” Lina Shahine, one of the journalists, said. Journalists are planning to hold another, large demonstration Monday. The statement accused Palestinian female television journalists of acting “without shame or morals.” The extremist group, which recently appeared in the increasingly lawless Gaza, has claimed responsibility for several bombings of Internet cafes, accusing them of providing access to pornographic sites for young Palestinians. Lawlessness has increased in Gaza, one of the most over-crowded places in the world, following the withdrawal of Israeli troops and settlers in 2005 after a 38-year occupation, the coming to power of Islamist Hamas last year, and a subsequent Western economic aid boycott on the Palestinian government. “Shame on you,” news anchor Sally Abed – one of 15 female anchors for Palestinian TV – said on Sunday, addressing the Islamist group.